The biggest difference between an exercise bike and a spin bike is that the latter most closely mimics the real outdoor cycling experience. On the other hand, exercise bikes are designed for low intensity workout inside the home. There are different types of exercise bikes. The major types are the upright exercise bikes and recumbent exercise bikes. Recumbent exercise bike is the one you would most likely find in gyms. 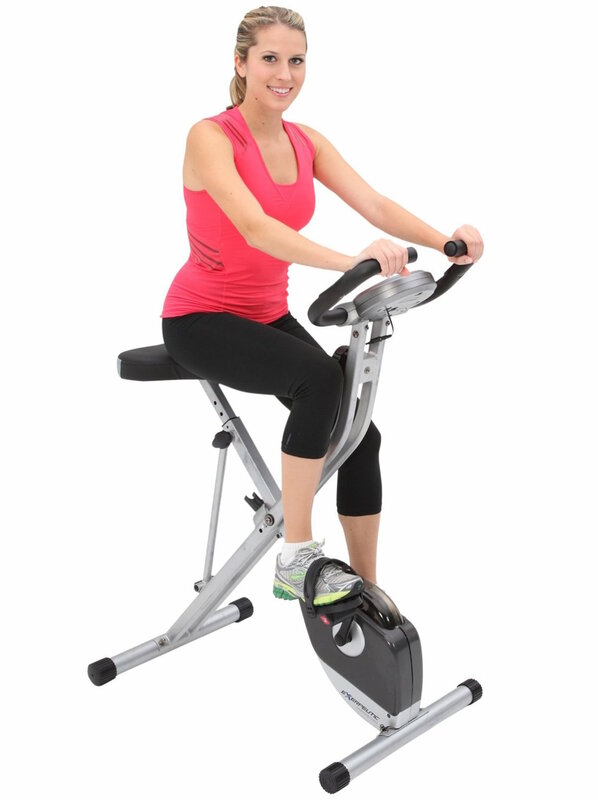 In this type of bike, support is provided for the back and it is more comfortable than the upright exercise bike. The features in a recumbent exercise bike vary as per the model but the biggest difference from an upright bike is that it allows you to exercise without too much discomfort. The only disadvantage of this type of bike is that you are not able to get a complete body workout. As far as upright exercise bikes are concerned, these bikes have a raised seat and do not offer any support for the back and the arms. In this bike, you will sit upright and it allows one to engage all the core muscles. Compared to the recumbent exercise bikes, they provide a more intense workout. Also, it feels more like a regular bike. If you are beginner and are looking to trim your waist, you should choose a recumbent exercise bike whereas if you want a complete body workout, go for an upright one. When it comes to design, the biggest difference between a spin bike and an exercise bike is the flywheel. The flywheel is connected to the pedals through a chain just like the standard bicycles. 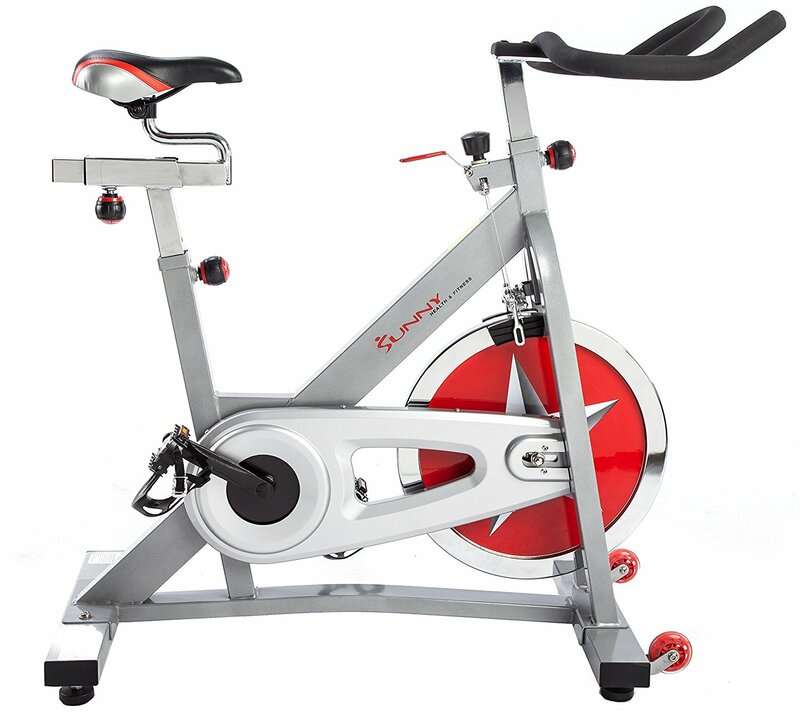 The seat on the spin bike is also similar to a standard bicycle. By working out on a spin bike, you are going to get a workout similar to riding an outdoor bike. You can also easily stand on a spin bike while pedaling, for a full body workout. Spin bike was initially targeted at athletes to let them work out in the comfort of their homes. However, due to its huge benefits, it has become extremely popular in the last few years. When it comes to choosing between these two types, the choice depends on the fitness objectives. Spin bike offers you a very intense workout especially considering the time you are going to spend on your workout. Your workout is going to be much more intense as compared to an exercise bike. In simple terms, if you want to lose weight, you should choose a spin bike over an exercise bike as it allows you to burn more calories in the same period of time. However, it is not the right bike for everyone. In fact, beginners should not choose a spin bike over an exercise bike as it offers only high intensity workouts. Therefore, if you have any kind of joint pain or body pain or you are not in good physical shape, you should choose an exercise bike and once you have become fit enough, you can go for a spin bike. Beginners are recommended to choose a recumbent exercise bike to enhance their fitness level. The flywheel of a spin bike usually weighs from 38 to 44 pounds. As mentioned above, the pedals are connected to the flywheel through a chain and moving the pedals gives you a feeling of climbing a hill on a bicycle. Most of the bikes available in the market allow you to make changes to the resistance levels. Handlebar alignment, seat height and saddle position can also be changed to suit you. It is important to keep in mind that a spin bike behaves exactly like an outdoor bike. It means that you cannot instantly stop a spin bike, if you have a problem as the inertia keeps moving the flywheel. Also, high intensity workouts can lead to injury if attention is not paid to safety procedures. As far as the cost is concerned, both of these types have similar prices. The basic models are available for less than $200 whereas some of the higher models can go into thousands of dollars. Overall, if you are looking to lose weight and want to add a stationary bike to your home gym, you should go for a spin bike. However, you need to be in good physical shape to get the most out of a spin bike. If you already have some health issues such as joint pain, it is recommended to opt for an exercise bike and move on to a spin bike when you are completely fit.